Cape Cod Canal - Celebrating 100 Years! The Cape Cod Canal was officially opened on July 29, 1914. The idea for the canal is commonly credited to Myles Standish nearly 400 years ago!! The journey through the canal saves shipping traffic over 100 miles and at least a day's journey. To say that the canal has been a major improvement to commerce for Massachusetts and New England is an understatement. Local community members formed a committee to plan a variety of celebrations for the 100th anniversary of the canal. 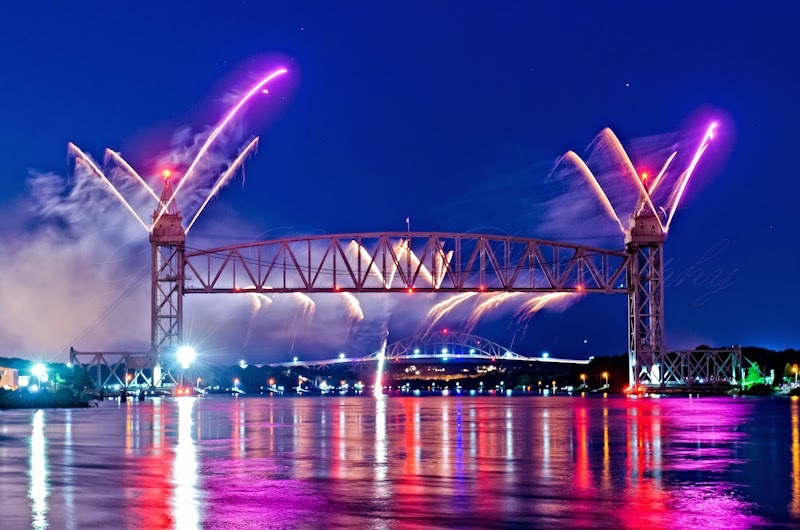 Perhaps one of the highest attended events was a firework show over the Cape Cod Canal Railroad Bridge. This fantastic event was sponsored by philanthropist David Mugar. 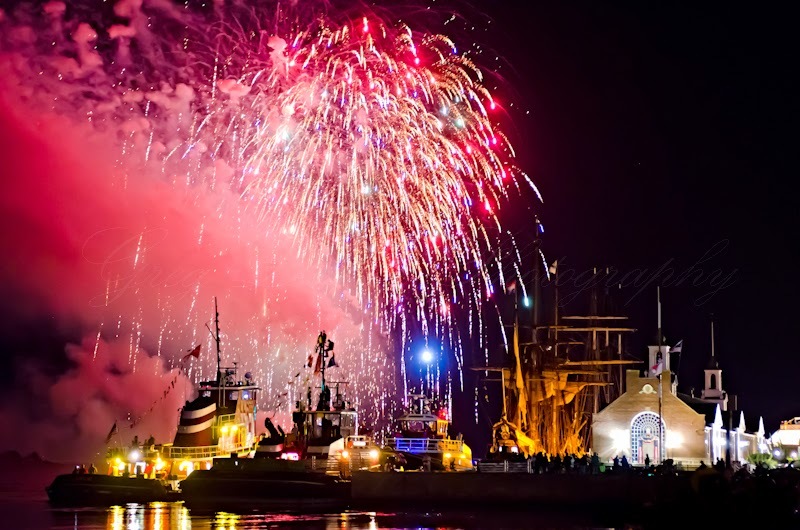 In addition to lighting the railroad bridge, a firework barge was positioned near the Massachusetts Maritime Academy. With two tall ships at the academy, the Kalmar Nyckel and the Mystic, there was a magical ambiance to the evening. With the fireworks exploding over the academy docks, the scene looked like it was the set for a movie. Making these images was a lot of fun and a little bit tricky. The fireworks were being launched from two different locations. Switching back and forth from one scene to the other was not ideal, but it did offer a little variety. The firework show was so prodigious that it was hard to make an excellent exposure of the fireworks and the docks. The docks and the tall ships were generally underexposed and the fireworks were overexposed. Originally I tried for longer shots of 10 seconds or more in order to give plenty of light to the ships and the dock. I had hoped to use a relatively low ISO to minimize noise. There were so many fireworks, that long exposures were simply blowing out the highlights. Using my Nikon D 7000 I switched to higher ISO's such as 1600 and 3200. This allowed me to correctly expose the dock and the ships. It also gave me the opportunity to isolate individual fireworks with shorter exposures of 1/5 of a second. One of the mantras of photography is to be persistent. Perhaps my favorite image of the evening was made with the last firework of the night. Near the end of the firework show, I knew that I had made excellent shots from my original vantage point. I took a risk and moved approximately 100 yards and reset my focus. 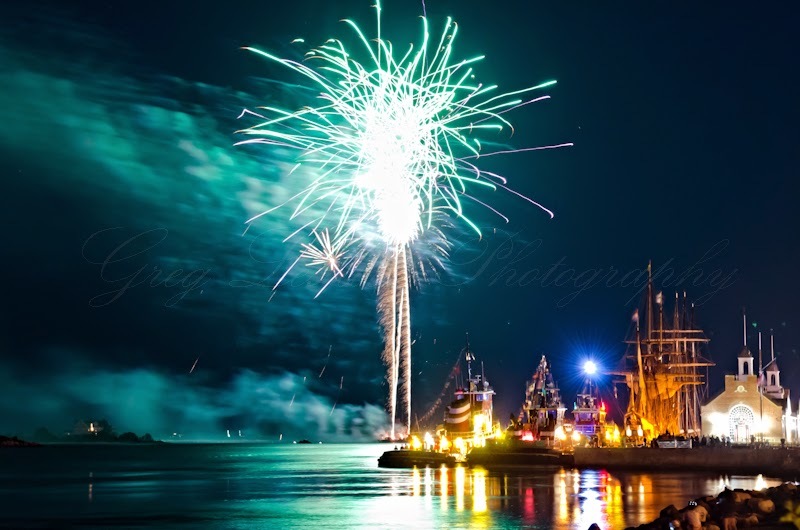 This allowed me to show more of the docks and tall ships, which truly made the scene! Many photographers might be surprised to learn that I used f stop 2.8 for my final image. Using one of my favorite lenses, the Nikon 24-70 f/2.8, I had positioned myself far enough away from the scene that it didn't require a large depth of field to make this image work. The additional light helped to correctly expose the docks and it allowed me to use a faster shutter speed. Night photography is often a game of compromise. In other words, using a shallow depth of field allowed me to use a faster shutter speed. In addition, I set my white balance to tungsten which helped to make a cooler blue cast on the images. On my latest trip to Acadia National Park, I was acutely aware of time. My family had one precious week to stay in one of our favorite places. Our daughter was 9 months old and growing stronger every day! 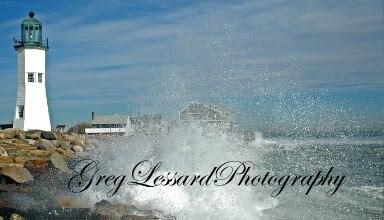 The ocean waves at Thunder Hole were arriving approximately every ten seconds in a relentless pounding of the seemingly eternal pink granite shore line. Every where we visited, time was on my mind. It became a major theme in my portfolio of this journey. On my last night of the trip, I visited Jordan Pond to create an image with star trails. This beautiful wheel of time has been spinning over Acadia for thousands of years. It has presided over the glacial actions that formed this beautiful landscape. It was present when the Abenaki people first visited these verdant summer hunting grounds. The stars above are as close to eternal as we mere humans can comprehend. This scene is one of the iconic, clichés of Acadia National Park. Two Adirondack chairs romantically overlooking Jordan Pond and the famous Bubbles has been photographed numerous times. By photographing at night, I hoped to put my own spin on the famous scene. This is the lawn that the wealthy and famous rusticators reposed on during the Gilded Age. The most powerful Americans at the turn of the last century came here as a way stop on their journeys from one side of Mount Desert Island to the other. They would drink tea and eat popovers to refresh themselves on their long carriage rides. Today, one of the highlights of Acadia National Park is to enjoy a popover (I prefer them lathered in strawberry jam or ala mode:) and take in the incredible views from the lawn. It is hard not to imagine Jordan pond a century ago. 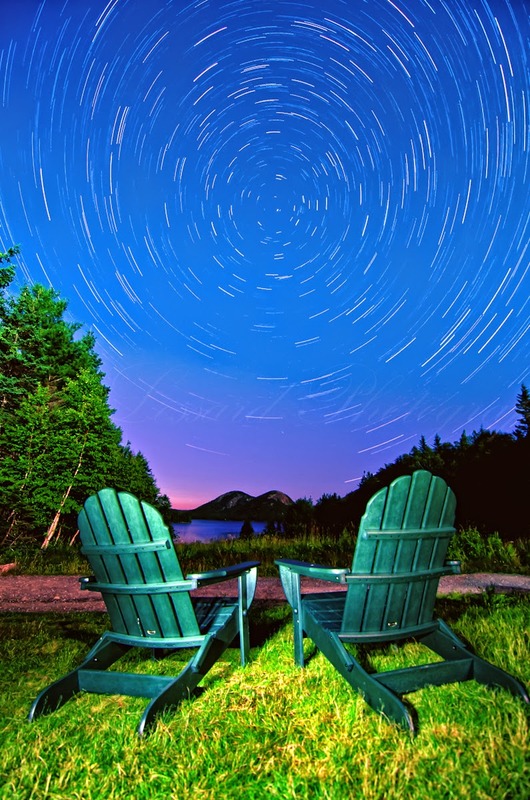 Acadia is well known as one of the best spots for star gazing on the east coast. The island hosts an annual star gazing festival each September. The bright stars allowed me to make this star trail image even with a full super moon! I often try to use the moon as a natural lighting source for my night images. Of course, the brighter the moon is, the less bright the stars will appear to be. It is a testament to the dark skies of Downeast Maine that these stars can be seen so clearly. On a recent trip to Acadia National Park, I was very fortunate to witness one of the most beautiful sunrises at Otter Cliffs. There were plenty of clouds in the sky with just enough space for the sun to peak out and color the clouds and sea a very vibrant pink. There was one other person at this iconic setting to view this beautiful scene. He and I could hardly believe that we were the only two people in America to witness this glorious moment in nature. 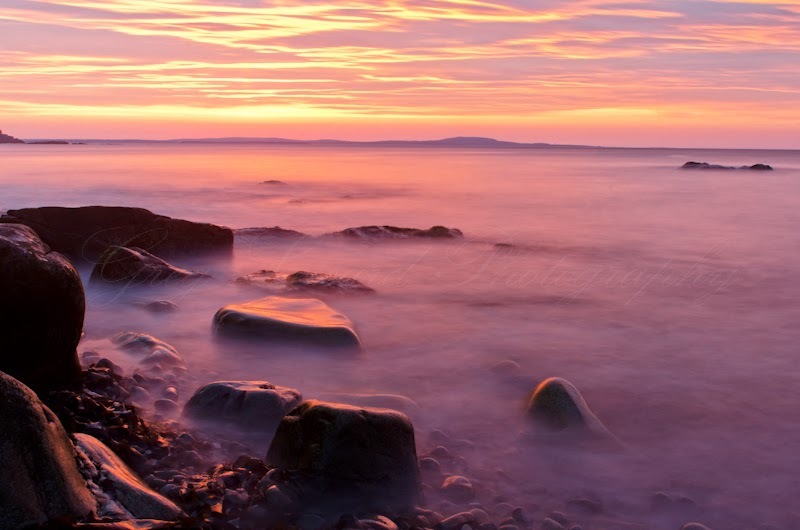 Just before the sun broke over the horizon, the pink of the sky was reflected onto the sea. For a few brief moments, the land and sea was transformed into an other worldly scene. The chance to return to one of my favorite places and commune with nature rejuvenated a piece of my soul. Seeing God's creation and witnessing his glory is truly an uplifting experience! My hope is that you will view this image and be inspired to get up early for a sunrise or stay out late for a sunset and experience the wonder of nature too. In October, I will be returning to Otter Cliffs as part of my three day fall photography tour that I will be leading for the South Shore Science Center. There are still some spaces available. You can read more about this trip here http://blog.greglessardphotography.com/2014/05/fall-photo-tour-in-acadia-national-park.html I do hope that you will join me on what will surely be a fantastic adventure! Eastern wild turkeys have been successfully reintroduced to Massachusetts. After having been extirpated from Massachusetts for more than 100 years, the turkeys are now abundant. Reintroduction programs from the 1970’s through the 1990’s have restored this bird as part of our natural heritage. As a kid, a wild turkey in eastern Massachusetts was nothing more than a legend. Like the bald eagle, the turkey was a myth. The descendants of the Pilgrims had eaten all of the turkeys in Massachusetts. I would fantasize about seeing wild turkeys and bald eagles much as the Pilgrims and Native Americans had. Fortunately, due to conservation and wildlife management efforts, that childhood fantasy is now a reality. According to Massachusetts government surveys, there are approximately 20,000 wild turkeys living in our state. This is only fitting considering the history of our nation and the prominence of Massachusetts in the story of Thanksgiving. This spring, I returned to what I consider to be a hotspot for viewing and photographing wild turkeys. There is a neighborhood not too far from Plymouth Rock that supports a very large flock of turkeys. There are at least eight toms and over twenty females. These turkeys comfortably avoid hunters during the spring by residing in the yards of local residents. Fortunately for me, this makes them easy to photograph. Using my car as a mobile blind, I will often spend my mornings witnessing one of the great spectacles of nature. The mating ritual of the turkey is an amazing display of dancing, posturing and very colorful feathers and heads. 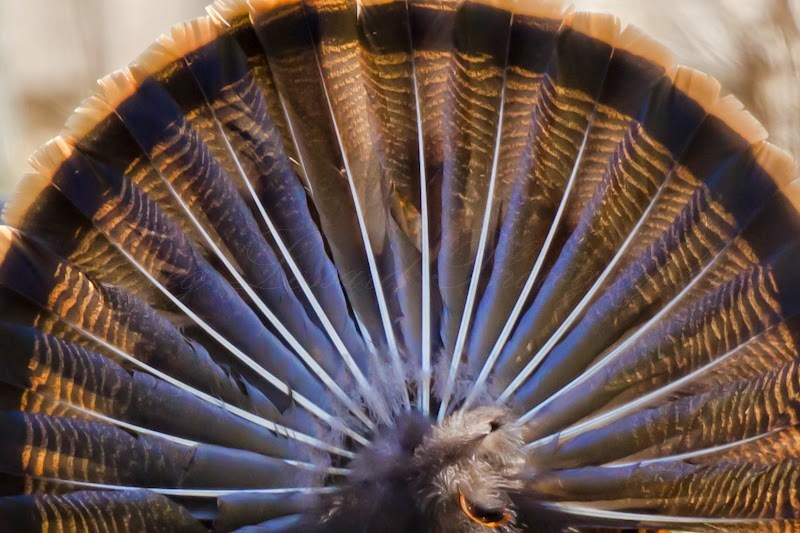 The male turkey’s head will turn bright blue while its neck will turn bright red. The male will display his tail feathers as a fan and scrape his wing feathers on the ground while slightly shimmying his feathers. The scraping of the wings creates a subtle rattle like sound. It is commonly believed that turkeys are stupid. Among people in the know, turkeys are considered to be incredibly wily. The intelligence of wild turkeys makes them a challenge to photograph. A few tips for making your own image include using a long lens (300mm or longer), use your car as a blind, and look for turkeys during the mating season. During the mating season, male turkeys need to display to attract females and they generally let their guard down, allowing a closer look than at other times of the year. This Month’s Tip: If you are successful in finding turkeys to photograph, try to create artful images that communicate your feelings for this fantastic creature. This will often occur after you have repeatedly visited the turkeys. The more time you spend in the field, the better your chances will be to create a beautiful masterpiece. Greg Lessard is a professional photographer. You can join him on a three day tour of Acadia National Park this fall. Visit http://blog.greglessardphotography.com/2014/05/fall-photo-tour-in-acadia-national-park.html to find out more.